Defines functions that change display graphics, control cursor movement and reassign keys. The ANSI.SYS device driver supports ANSI terminal emulation of escape sequences to control your system's screen and keyboard. An ANSI escape sequence is a sequence of ASCII characters, the first two are the escape character (1Bh) and the left-bracket character (5Bh). The character or characters following the escape and left-bracket characters specify an alphanumeric code that controls a keyboard or display function. ANSI escape sequences distinguish between uppercase and lowercase letters; for example, "A" and "a" have completely different meanings. To load this file within Windows 3.x or Windows NT use the below line. [drive:][path] Specifies the location of the Ansi.sys file. 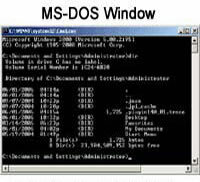 Additional [drive:][path] specifies the location of the Ansi.sys file. Additional information on where to load these files can be found in the how to load section. /k Causes ANSI.SYS to treat a 101-key keyboard like an 84-key keyboard. This is equivalent to the command SWITCHES=/k. If you usually use the SWITCHES=/k command, you will need to use the /k switch with ANSI.SYS.